Barry Finlay’s review of Divine Prosperity, The Unexpected Income Program: Twelve Steps to Your Perfect Consciousness of Infinite & Eternal Supply! Barry's Reviews > Divine Prosperity, The Unexpected Income Program: Twelve Steps to Your Perfect Consciousness of Infinite & Eternal Supply! 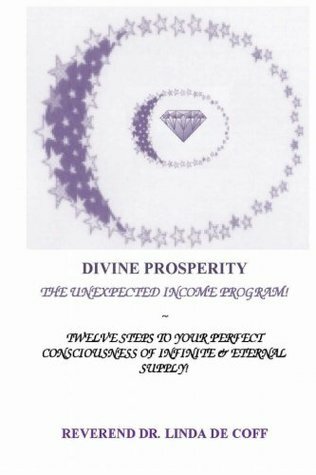 Divine Prosperity, The Unexpected Income Program: Twelve Steps to Your Perfect Consciousness of Infinite & Eternal Supply! Author Reverend Linda Decoff states at the beginning of the book, “If you are about to go into enormous change, or have just created enormous change, or are very much seeking to manifest an upgrade, over the past period of experience, this book is for you.” She couldn’t have described the book any better. Divine Prosperity is comprised of twelve stages, each of which builds on the previous stage or stages. Each chapter is followed by an “Instruction” or lesson that leads us through the building blocks necessary to personal prosperity, encouraging us to start with a clean slate, eliminate any erroneous beliefs, establish our worth and so on. Each chapter is also followed by a daily meditation. The lessons are invaluable, but they are enhanced by Reverend Decoff’s own personal experiences and those of friends and acquaintances, that are sprinkled throughout. As Linda says, the book will be of most benefit to those going through change or looking for an upgrade, but even if you are perfectly satisfied with your personal prosperity, the book will force you to think, remember what got you to where you are and remind you to continue along that path. It is the kind of book that can be kept close by to pick up from time to time as a refresher. Divine Prosperity is a 5-star read. Sign into Goodreads to see if any of your friends have read Divine Prosperity, The Unexpected Income Program.